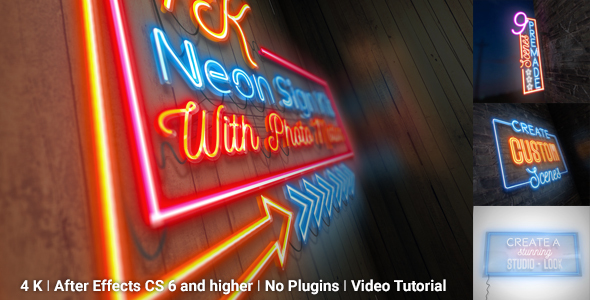 Easily create neons with your text, logos and images in 4K. Create stunning logo stings, or how about a cool intro or trailer for your YouTube channel! There are no limits! And the best of all the templates also includes scenes with photo motion, so that your animation will have a real 3d effect! Now present your logo high above the city’s rooftops, a street alley or a road to Vegas. You can also create your own scene and customize everything by yourself. Choose from different backrounds. wood, bricks, concrete wall, glass, wire fence or a plain wall. Use it for your sport channel, create an amazing product video/promo or simply design your very own animated gif! BRAND NEW A MUST HAVE TEMPLATE!